One of the highlights of my filmgoing year is the annual visit to my favourite city for the Edinburgh International Film Festival. In fact, my single favourite place to watch films is screen 1 of the Cameo Cinema. I still remember my accidental discovery of the Cameo during a visit to the Fringe Festival some years ago. Not only were you allowed to take alcoholic drinks in with you (a sign chalked up on the foyer board explained, ‘We’re civilised at the Cameo and we like to think you are too’) but the seats were like armchairs, quite the most luxurious I’d experienced in cinemas to that point, and particularly welcome after the bum-numbing church hall chairs I’d been sitting on for much of that week. (The film I watched – because I know you’re wondering – was Bertolucci’s Stealing Beauty). I love the Cameo so much that my choice of screenings to attend is often influenced by whether or not the film is showing there. I’m certainly fond of the EIFF’s other venues too; the Cineworld is a multiplex like many others, though a perfectly acceptable one, and its large seats and generous legroom come as a relief after a few screenings in the cramped and often stuffy Filmhouse screen 1. I do still regret the EIFF’s decoupling from the various other August festivals – I can’t imagine a better place to be than Edinburgh during August – but as they’re selling far more tickets without the distraction of all those pesky live events, there’s no chance of it moving back, and you can hardly blame them. In fact, the 2009 Festival was so successful that there were far fewer tickets available for industry liggers like me for the evening public screenings, obliging me to spend more time watching films on the little computer screens in the videotheque. For me, the best thing about Festivals is walking into a film about which you know next to nothing, but which turns out to be fantastic – something you immediately want to push to an audience, to share it with as many people as possible. Past examples off the top of my head include Incident at Loch Ness, a hilarious mix of Blair Witch and Spinal Tap starring Werner Herzog as himself that sadly never had a UK release, and last year’s The First Day of the Rest of Your Life. I know very little about most of the films at this year’s Festival (with the obvious exception of Toy Story 3 – pretty sure I’ve heard something about that one) but they are showing a couple of things I’ve seen and liked. One is The Runaways, the story of the 70s US teen girl band I’d previously never heard of (though their line-up did include Joan Jett – her I did know of, though I’d always assumed she only ever recorded one song). It features good work from Kristen Stewart and Dakota Fanning as Jett and singer Cherie Currie, and captures the heady atmosphere of being young, famous and off your head very well (or so I suppose, having little experience of any of those things). The other is The Secret in their Eyes, the Argentinian film that won the Best Foreign Language Film Oscar. That’s one category the Academy can be guaranteed to get wrong, pretty much every year. In a year that included Michael Haneke’s The White Ribbon, they gave the award to a potboiler thriller. I’ve absolutely nothing against the film – it’s a perfectly competent, entertaining watch that deserves an audience – but it’s no work of art. It should appeal to the many who enjoyed the film adaptation of The Girl with the Dragon Tattoo, although as the source novel is unknown over here and the film is being released by the not-exactly-flush-with-cash Metrodome, it will only do a fraction of the business. To an extent, I’ll try not to find out too much detail about the programme, but scrolling through the website, there are things I’m already keen to see. 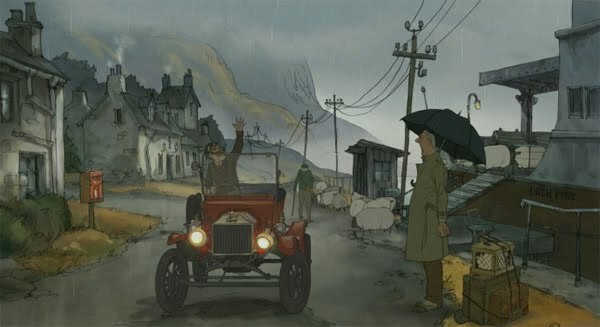 Obviously this includes the gala opening, Sylvain Chomet’s The Illusionist, which the Belleville Rendezvous creator set in Edinburgh after falling in love with the city during a previous festival. Then there’s the Dutch horror Two Eyes Staring, Brit thriller Cherry Tree Lane, plus the retrospective strand on forgotten British film: a chance to see some vintage films I’d never even heard of, let alone had the chance to watch. I’ll be there for the first six days of the Festival. That’s time to see 30 films, easy. Plenty to discover. I can’t wait. This entry was posted in Edinburgh, Festivals and tagged Cameo Cinema, Edinburgh Film Festival, EIFF, Runaways, The Secret in Their Eyes on June 5, 2010 by Gareth Negus.